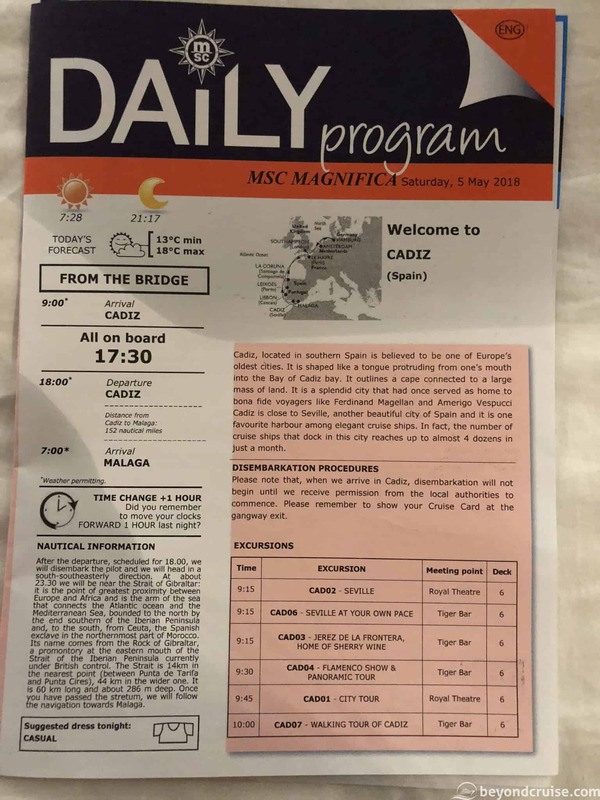 We awoke early this morning and watched the ship’s bow slowly rotate through 180-degrees as we quietly crept into the port of Cadiz. 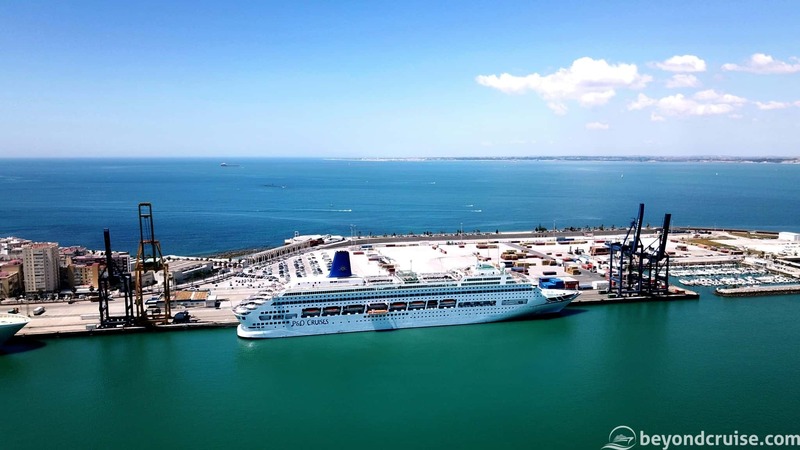 We are berthed at the Cadiz Cruise Terminal today and just in front of us is P&O Cruises Oriana, making her last port call before her voyage back to Southampton. This is our fourth port call out of eight. 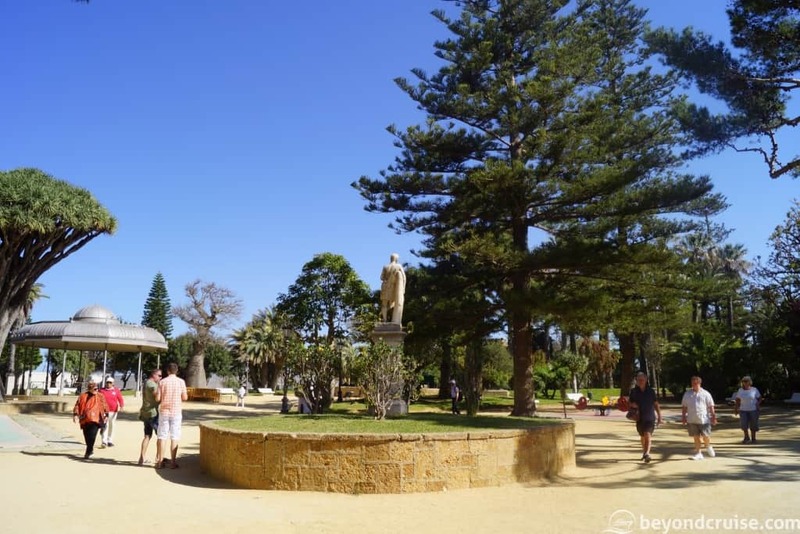 The sky is completely blue and the temperature will be 20c+ we’ve been told – typical Spanish weather! This morning we went up to the Sahara buffet and had a nice healthy breakfast to set us up until lunch (which we plan to have in Cadiz). The buffet offers plenty of hot food for breakfast, but if your thing is cereal or fruit – it has you covered too – there is a large choice available and if you can’t find something, all you need to do is ask one of the staff – they really are very helpful. After breakfast, we went back to our cabin and collected all our cameras and other electronics for the day and then headed to the Royal Theatre on Deck 6. Today we are taking a tour with MSC Cruises. 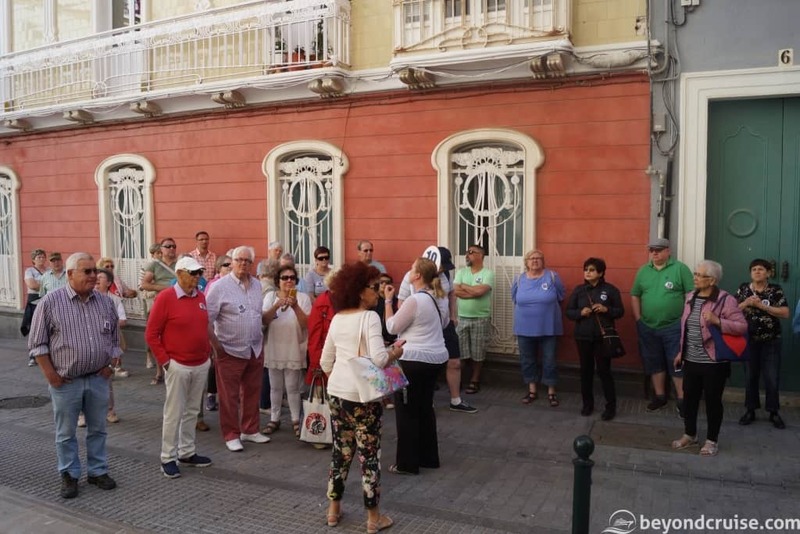 The tour we are taking is the City Tour of Cadiz – it is a simple 3.5hr tour organised by the ship and will show us the highlights with a guide via coach and then a walking tour through the old city. We’ll be given spare time to do our own thing and then we can either be taken back to the ship at the end or we can make our own way back. After handing over our ticket and receiving a sticker with a number “10” on it (our tour group number) we proceeded to the gangway which was located on Deck 4. 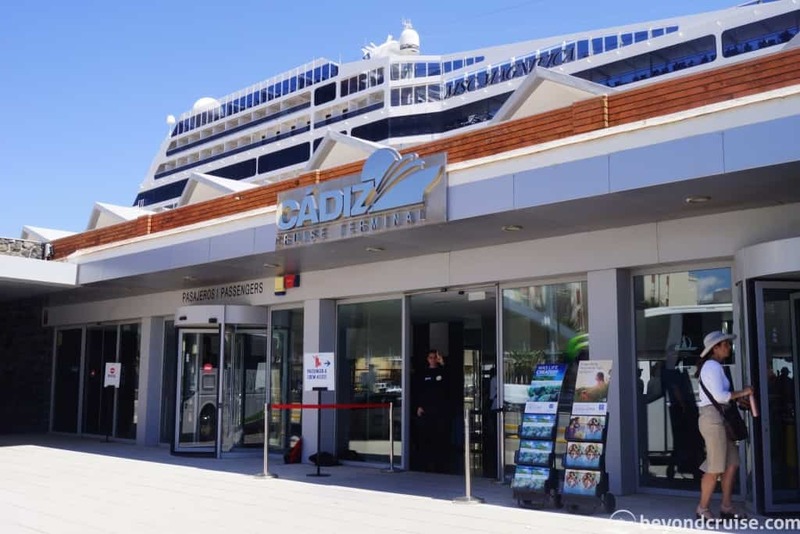 We exited via the larger of the two Cadiz Cruise Terminal buildings, once outside, our coaches were just on the left and we boarded coach number 10 ready for our tour. Total time from ship to coach – 3 minutes! Our excellent tour guide, Caroline, joined the coach and was tasked with narrating our journey in both German and English, and did a wonderful job might I add! She alternated when she spoke German/English so that neither party was missing anything or the flow of the tour was broken. I can’t stress enough how great it is to tour a new city or destination with someone who knows it inside-out and can answer any “What is that?” questions. 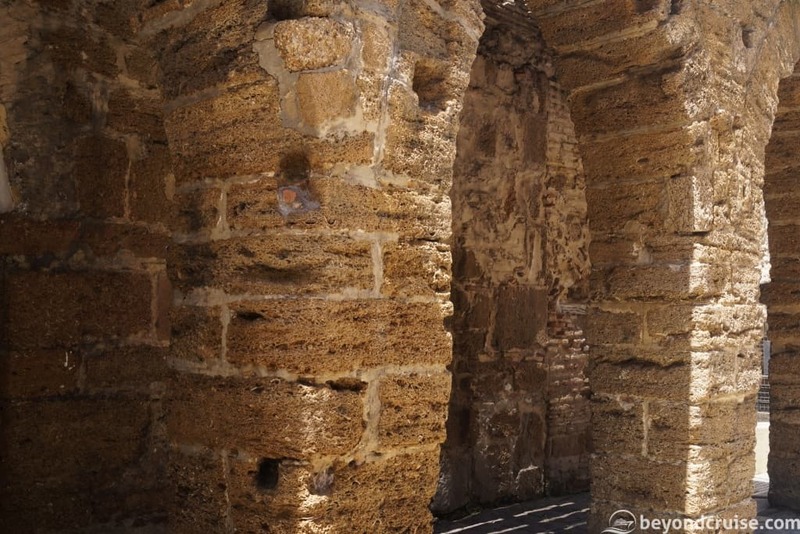 We drove from the terminal along the main road and under the old city gate. As one of the oldest cities to be inhabited by humans in the western world, the city is dotted with remnants of medieval fortification. The tour left the city briefly to cross the Bay of Cádiz across the old José Leon de Carranza Bridge. It opened in 1969 and is amongst the longest bascule bridges in Europe at 1400m. It only has three lanes and depending on the traffic, the middle lane switches direction several times per day! When we got to the other side, we were told flamingos can usually be seen in the marshes by the road on migration from Africa, but unfortunately, we didn’t catch sight of any today. We then looped back and returned to the city via the new bridge, The Constitution of 1812 Bridge, also known as La Pepa Bridge. The La Pepa bridge was built to meet the demand of the cities’ 40,000 daily commuters; people like to work in Cadiz, but not live in it. It is one of the only cities in Europe with a declining population. 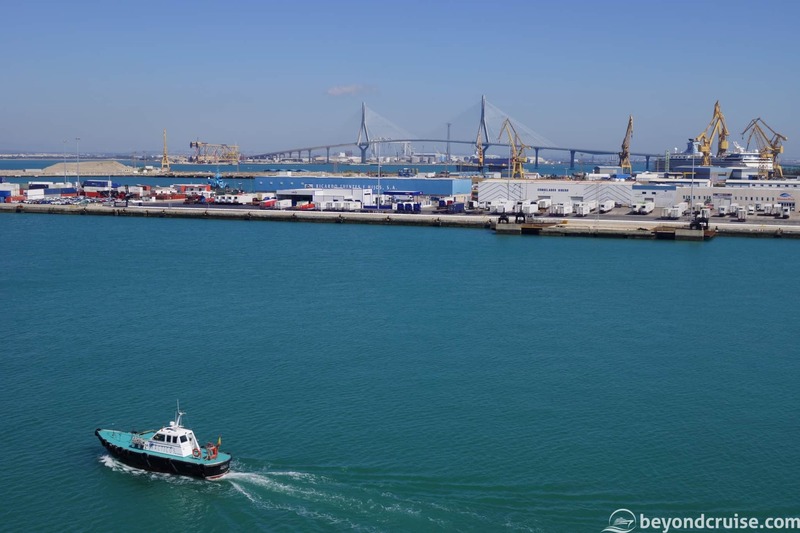 The bridge opened in 2015 and has a height clearance of 69m to future proof the bay for large ships. 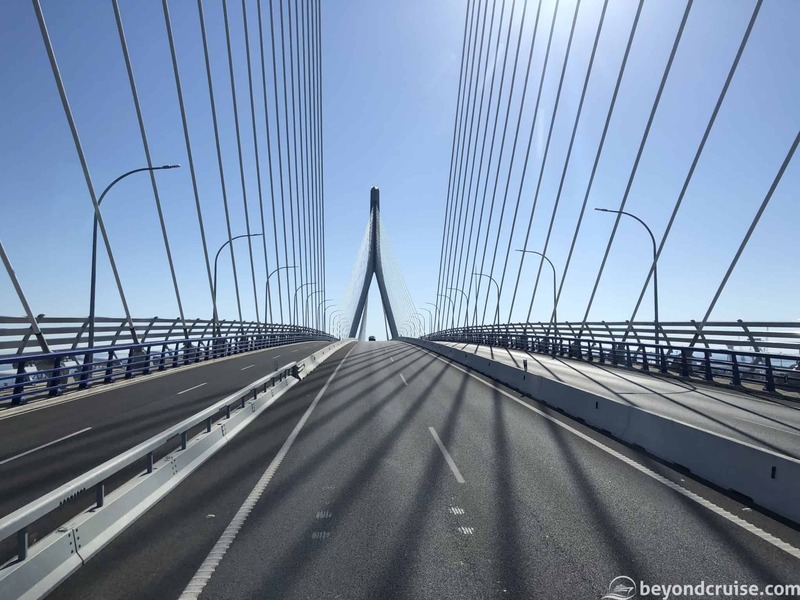 The highest point of 187 metres makes it one of the tallest bridges in Europe. We disembarked the bus for the walking portion of the tour at the Genovés Park and Botanical Gardens and proceeded to explore the tight streets lined with orange trees. There were so many photo opportunities to take advantage of as we made our way to the Parliament of Andalucía, make sure whatever device you bring has plenty of room! The parliament building is fascinating from the outside and well worth a visit when you are here. 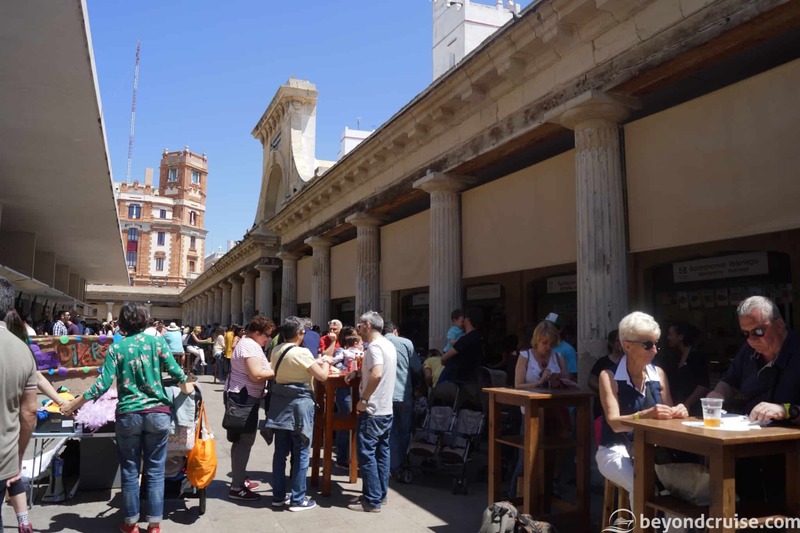 Next stop was the Plaza de Las Flores, the flower market full of fresh flowers. Caroline gave us a few recommendations for restaurants nearby including the Central Market which we would visit later. 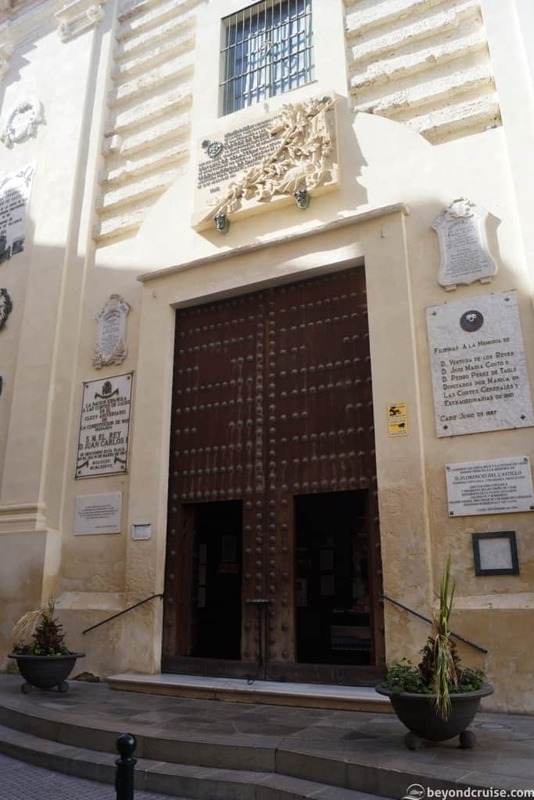 The next stop, a must for any visitors to Cádiz was the Cathedral. It’s a magnificent Roman Catholic Church that is easily spotted from many spots across the city. We were ushered through the exit into the Cathedral, skipping the queue (a priceless perk of booking a shore excursion!). 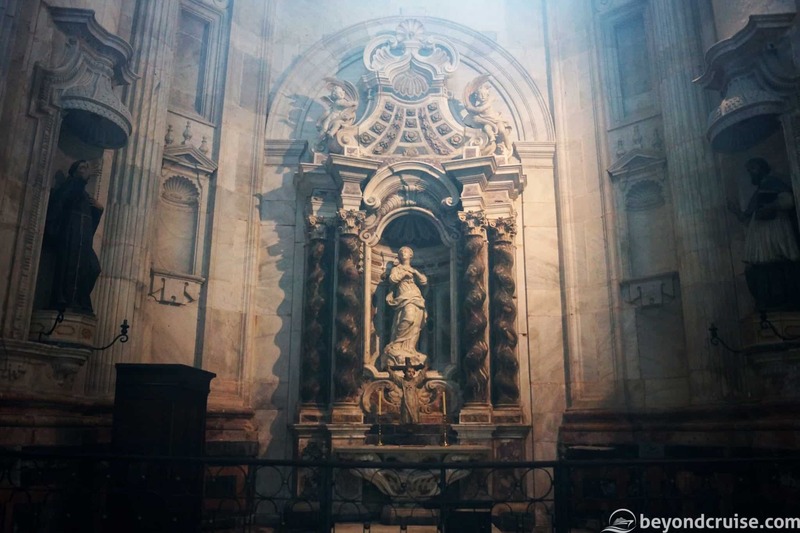 We were given some history and highlights to look out for as we explored the church and crypt before we were left to explore for some free time. We were due to meet the group at the statue outside in just over an hour. A great time to wander around or check out the surrounding area. 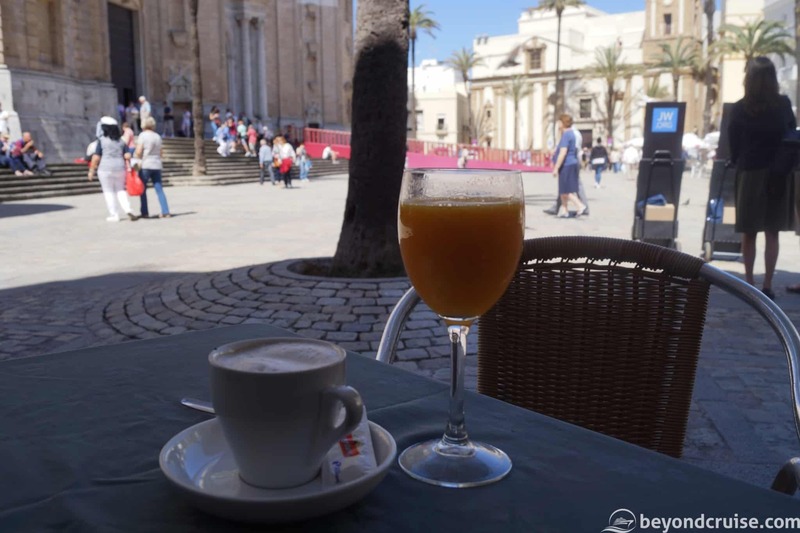 However, for us, we were on the hunt for a cafe with good WiFi to post yesterday’s blog! We were in luck as most of the venues had free WiFi but due to the excellent weather we were having, it was actually harder to find a table. We found ourselves a seat in the shade and ordered a coffee and a freshly squeezed orange juice. The bill came to 4 Euros, not bad as it is 95% tourists in this area. Before we knew it, free time was over and we headed over to our tour group, easily identified by our tour bus number labelled on Caroline’s sign. It was time to visit Museo Catedralicio. We had a 15 minute stop here which was enough to look through the small museum. It’s built inside the Casa de la Contaduría which dates back to the 16th century and also features excavations of a medieval street. 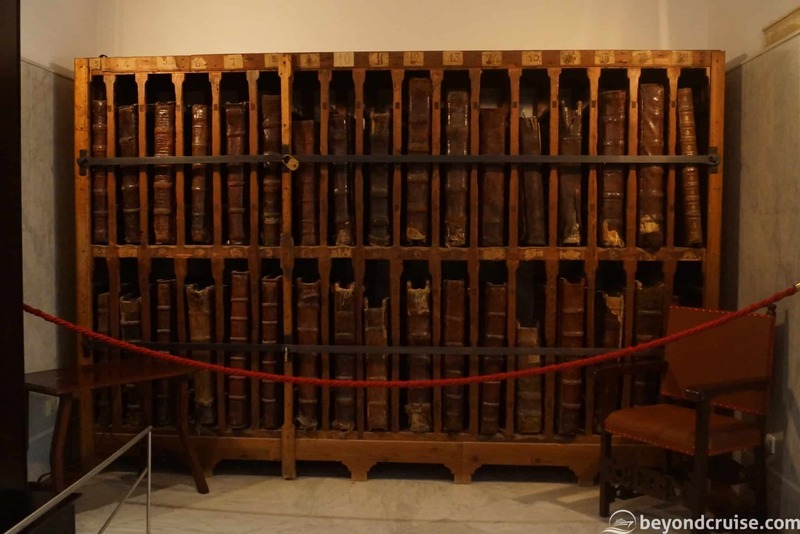 There were lots of paintings, sculptures and artefacts but the highlight for us was the Sala de Libros Cantorales – a bookshelf containing a whole library of massive old texts! The books are close enough to touch (but please, don’t!). We continued our wander around the city a little further and Caroline gives us facts on various points of interest. She brings to our attention to the type of rock that the city wall and a lot of the buildings are made of – Oyster stone bricks. Oyster stone amazingly doesn’t retain heat. Even after basking in the sun, the stone was cool to the touch. The perfect material for a city that can experience 45-degree heat in the Summer. When you get to Cadiz, touch it and see. 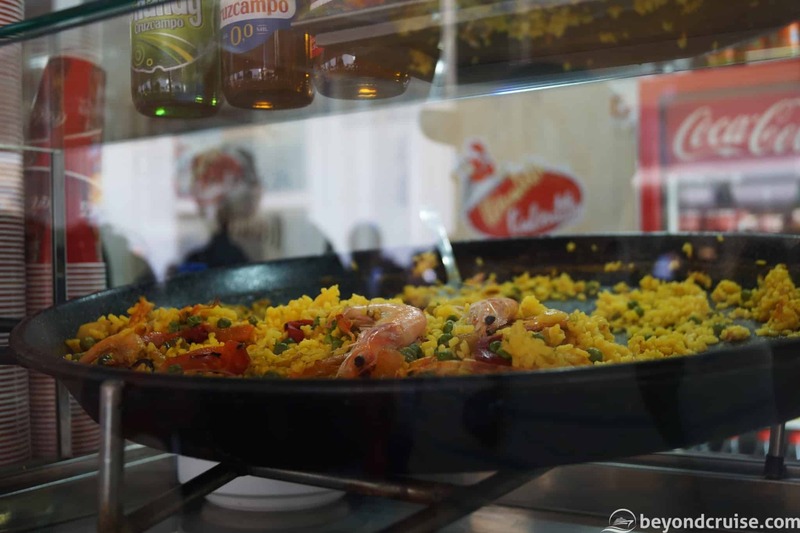 As a group, we walked back to the Town Hall and most people decided to join the coach and head back to the ship but we decided to find some Spanish food to try and walked in the direction of the market instead. We found the entrance to the walled market actually by accident, although our noses could smell the food before we saw it! There are around thirty family-owned food stalls around the perimeter of the market square and upwards of forty seafood and fruit and veg stalls inside the building. 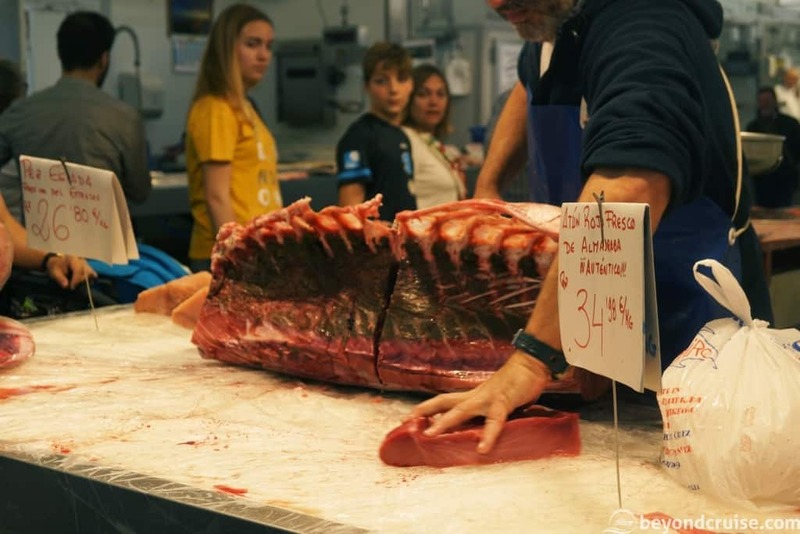 The fish stalls are awesome, you can find every kind of seafood here including massive tuna fish being carved up in front of you. It is time for lunch and we share a plate of paella from the market, an empanada and an apple tart. It’s a popular place for food with lines forming for the fish and chips. It has to be said, that we look to be some of the only tourists here, at least from another country. The majority are locals doing their Saturday shopping and meeting their friends and family for food and drinks. There is a supermarket nearby the market entrance and we stopped by for a look, the fresh bread and giant watermelons look great but the lines for the three open checkouts did not so we left empty-handed. 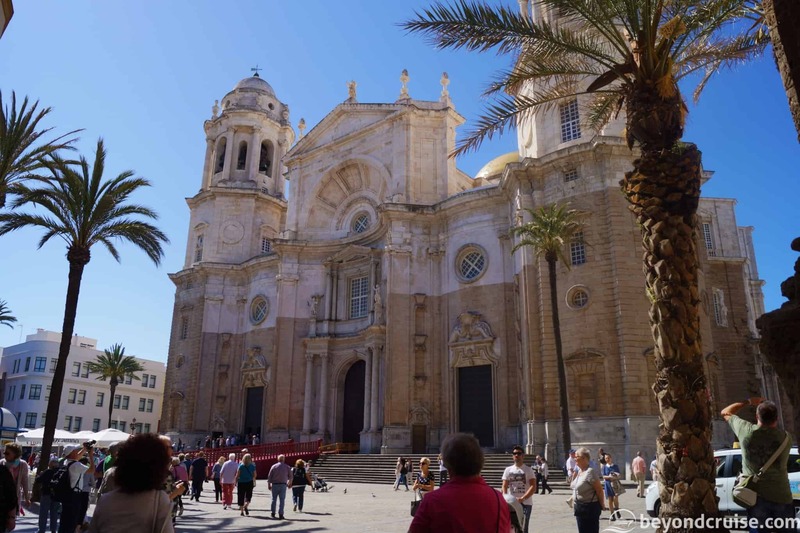 We find ourselves again by the cathedral (Cádiz is a small peninsula and Old Cádiz is especially easy to wander by foot). 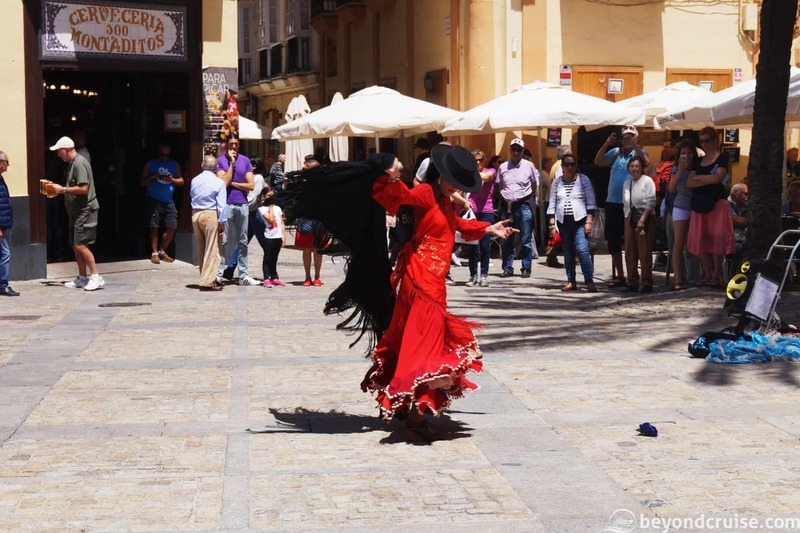 This time we’re greeted by loud Spanish music and a flamenco dancer performing for a crowd. 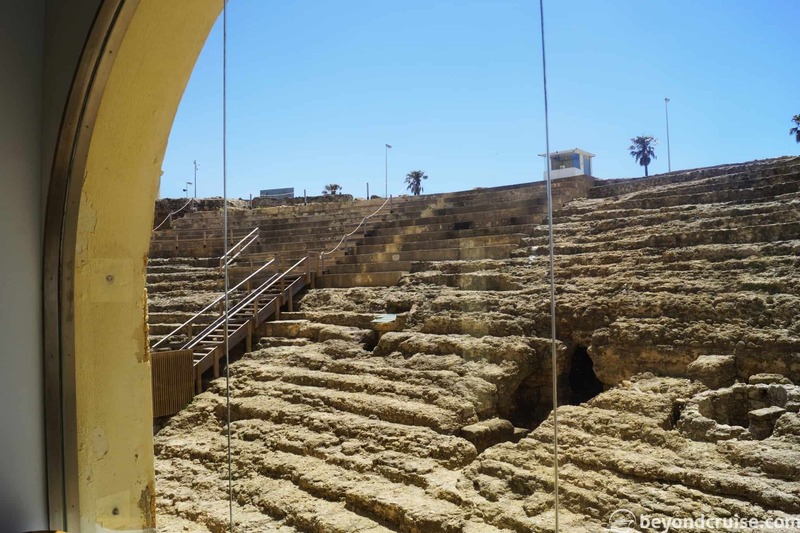 Another important site in the historic town of Cádiz is the Roman Theatre or Teatro Romano de Cádiz. Development on the land had begun when the theatre was discovered, this ended all plans for construction. 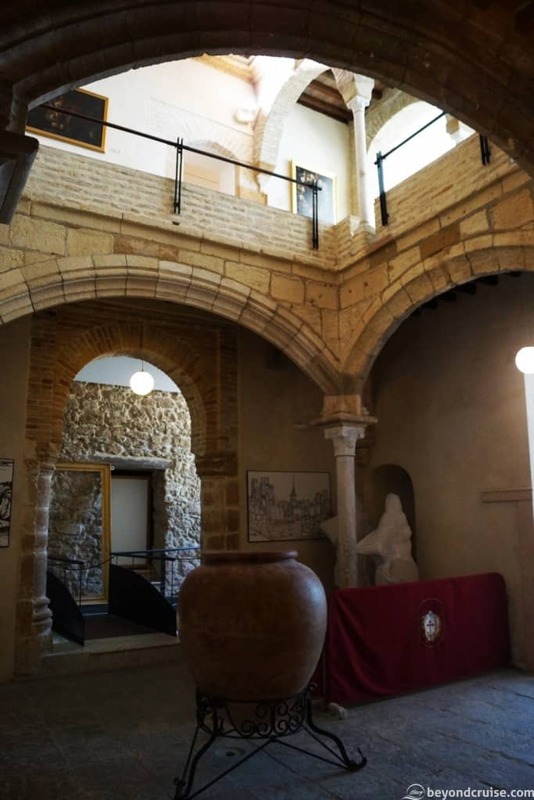 Now there is a museum you can visit which displays the ruins below and the exposed amphitheatre outside. Entry is free but for a simple request – they ask you to name your home country as a way of tallying where their visitors come from. After a day full of culture and history thanks to our wonderful guide and a well-planned excursion, it’s time to head back to the terminal. A quick stop-off for some drone shots of P&O Cruises Oriana and MSC Magnifica and we’re back onboard. Sailaway was delayed by around 90-minutes – so that made us late as were filming it from Deck 13 Aft. Therefore we missed dinner… again! Thankfully, the Sahara buffet provided an ample selection for us and we then headed back to our cabin to change. After a quick drink in the Topazio Bar (Deck 6) we walked to the Royal Theatre and saw the Addam’s Family show in the theatre, a new MSC production. We had wondered how MSC managed to create entertainment for guests of all languages and we were impressed with what they have done. The show was upbeat and feel-good with classic Addam’s Family tunes and remixes that got the audience clapping to the music. It was more like a musical without speaking parts, but the narrative was still clear. The show featured a large cast, choreographed dances and other performers that showed off their balancing acts and other circus talents. There was a lot of audience participation as performers danced through the aisles in their spooky costumes and we thought the torso-less man was a great addition! We went into the packed theatre with no expectations but found ourselves rocking to beat in no time. The show ran for around about 50 minutes. After the show, we headed up to Deck 13 to do some work whilst sat in the La Barchetta Bar and then around midnight we went up to Deck 15. Tonight we are only sailing 152 nautical miles to our next and furthest port on this trip, Malaga. We have headed South, then South Easterly before now heading East through the Strait of Gibraltar. One of the busiest and narrowest shipping lanes in the world. 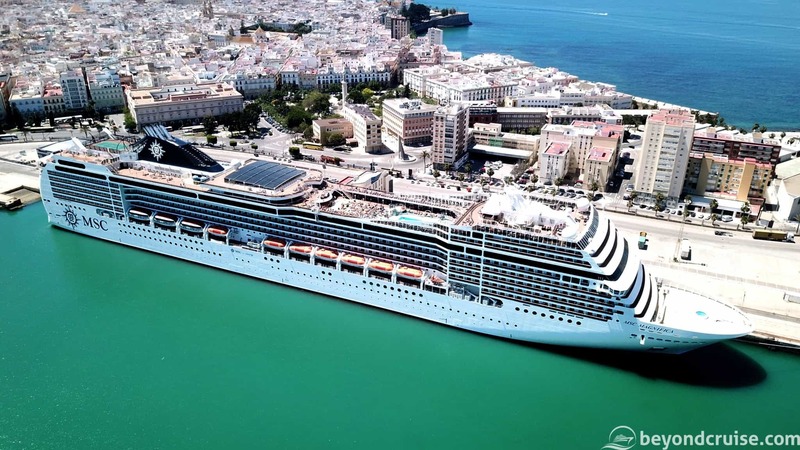 It connects the Atlantic Ocean with the Mediterranean Sea and for most cruisers, this is where their Med cruises really begin. We will be only stepping foot in the Mediterranean Sea briefly before we head back around Spain and Portugal tomorrow night. It was pretty windy on Deck 15 – but the air was very mild. It is reported it is 18c currently – not bad for midnight! 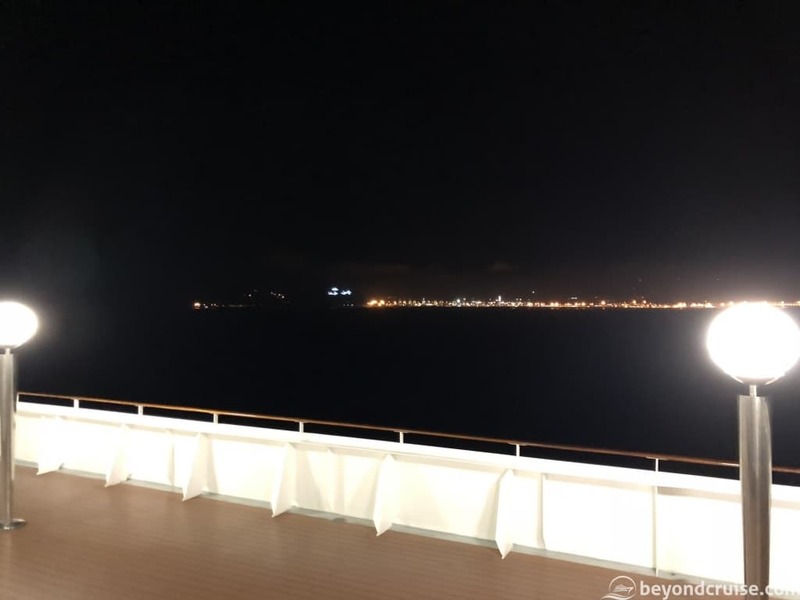 On one side we could clearly see the lights on the shores of Africa and on the other side of the ship we could see various dotted lights around Gibraltar. To see them so close like this is really special, it is just a shame it is pitch black out there! 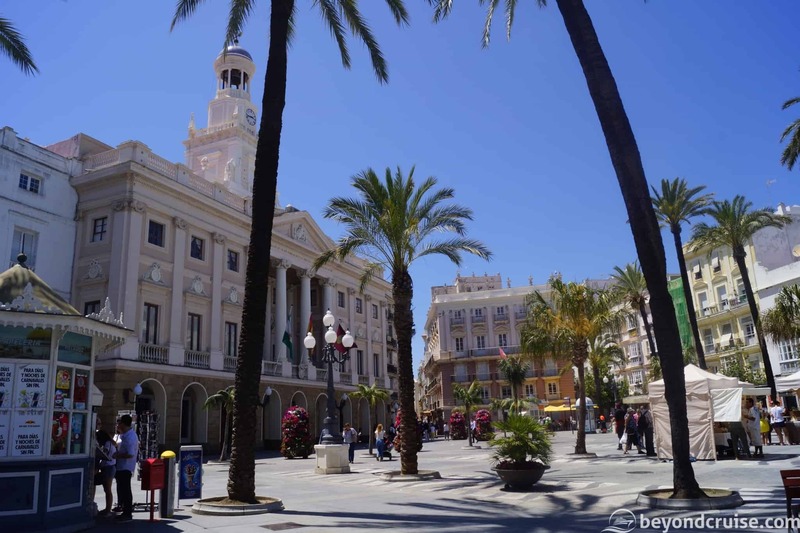 That’s all for now from us, tomorrow we’ll be exploring Malaga! 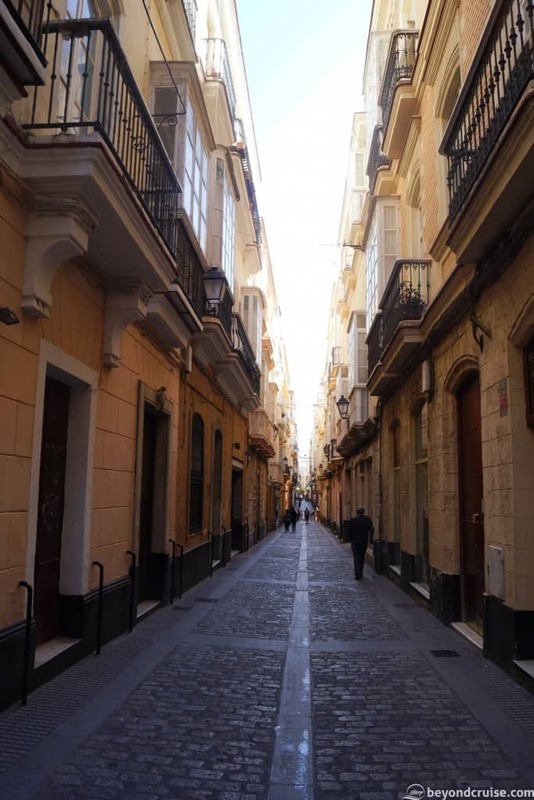 Update: Here are our videos from Cadiz!